Bharath Sanchar Nigam Ltd (BSNL) is India's largest Telecom provider. Bsnl providing services is Land line, Broadband,GSM (2G/3G).CDMA (WILL) WIMAX ( Rural/Wireless Broadband) and more Services. Bsnl providing Broadband Services very reasonable and less Prices compare to other private Broadband Services.But Some Problem have in Bsnl Broadband Services, Main major issue is Bsnl Broadband Modem Configuration, If you have 'Telenet TNDSL 2120' model Modem, are you using Bsnl Broadband Internet Connection. Follow the below instruction for 'Telenet TNDSL 2120' With Bsnl broadband Modem configuration. 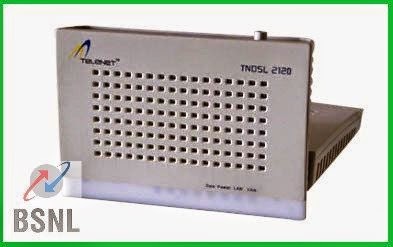 Bsnl Modem Configuration for Telenet TNDSL 2120 model Through PPPoE Mode. PPPoE Mode in this mode the modem connect Internet Automatically, No need to connect Internet every time.User Name and Password stored in side the modem. PPPoE Mode is most Secured compare to Bridge Mode, and possible to connect multi computers with signal modem. How to Setup PPPoE Connection Bsnl Broadband Adsl modem ? 1.First Open Your Web browser (Recommended Web browser Mozilla Firfox), Than Enter URL http://192.168.1.1 in the Address bar, You'll See Pop up window asking User name and Password. Enter User Name admin and Password admin.Click on OK Button. 2 Now You'll see Modem Configuration Control panel, like as shown below Screen shot. 3.Click on "Advanced Setup" -> WAN,Than Click on "ADD Button" for create PPPoE Setup. 4.Now Enter VPI and VCI Settings as VPI : 0 and VCI : 35 Keep all the other Values as Default.Than Click on 'Next' Button. 5. Than Choose Connection type PPP over Ethernet (PPPoE) and Click on 'Next' Button. 6. PPP User name and Password ( Here Enter your broadband User name and Password), Enter the Service name ( Dataone or Bsnl ), keep all other setting as Default than Click on 'Next' Button. 7. You Don't have to change any thing , Keep setting as default and click on 'Next' Button. 8. Click on 'Save' Button, Now your Modem Configuration will Be Saved. 9. Finally Click on "Save/Reboot" Button.Once Your Modem Configuring , Restart your Modem and Computer, PPPoE Connection in your modem , will be Connect automatically .